The heading for today's service was "Shone like the Sun" and we were called to worship with the words: "Transfigured by light, Jesus was changed. James, John and Peter saw it and were changed. Come away to the mountaintop; be still, be yourself, be who God intends you to be. Be changed." 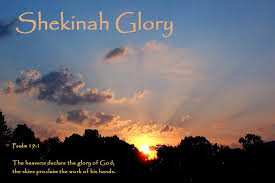 Of course there were other perspectives which were explored but the one that evoked the most unambiguous response in me was the image of God's holiness as untarnished, light: the Shekinah: God is present. This shining presence was the focus of all three Bible Readings: the first from Exodus 24.12-18, where God appears to Moses in the cloud which was necessary to cover that glory so that Moses would survive. The next was from 2 Peter 1.16-21 referring to God's presence as Jesus was proclaimed the "Beloved". The last reading was from Matthew 17: 1-9 which describes how the experience of God's presence manifested itself to Peter, James and John on the Mount of Transfiguration. On all these occasions the experience for those whom it touched was well out of anything that they could easily cope with. When God is present it is unmistakable. It cannot be ignored. There must be an authentic response. The hymns, too, reflected the same theme, with the first, Hymn 102, while not mentioning light, spoke of the formless nature of God, surging where it will. Hymn 675 was more specific, praying for God's radiant light of love to shine on us, while Hymn 602 also linked God's love with his light, asking that the blaze of God's light will restore the light we give to others. Hymn 268 continued the exuberant mood speaking of the joy that God's light brings with it and then Hymn 780 was a prayer bringing us to the logical conclusion that the light that we had thought about and rejoiced in through the service would become ours and show in our eyes. Amen to that. When John delivered his sermon, the point that struck me was that when Jesus was declared the "Beloved", the significance was that we are to follow him. Jesus' light shone brightly and unmistakably. I don't know if John said this, but I heard: Jesus’ light is such that we don't even have to open our eyes. That light is such that it penetrates out hearts and minds, even when our eyes are shut. That penetrating light assures us of God's love and that he is calling us to a new way of living. The question is: Do we want to see? The Prayers of Intercession were pleas that we all will see: that we all will see the way of light and how to live it in community with each other. ​Let us not linger too long on this mountaintop. Go and bear God’s light to a world that longs for peace. May God our Creator, Redeemer, and Comforter walk with us now and forevermore. May the blessing of that same God almighty, the Father, the Son, and the Holy Spirit, be upon you and remain with you always. Amen. Today I am offering notes and reflections on two services. This has came about because of pressure of other responsibilities. I hope I can return to something more regular in the future. Margaret. 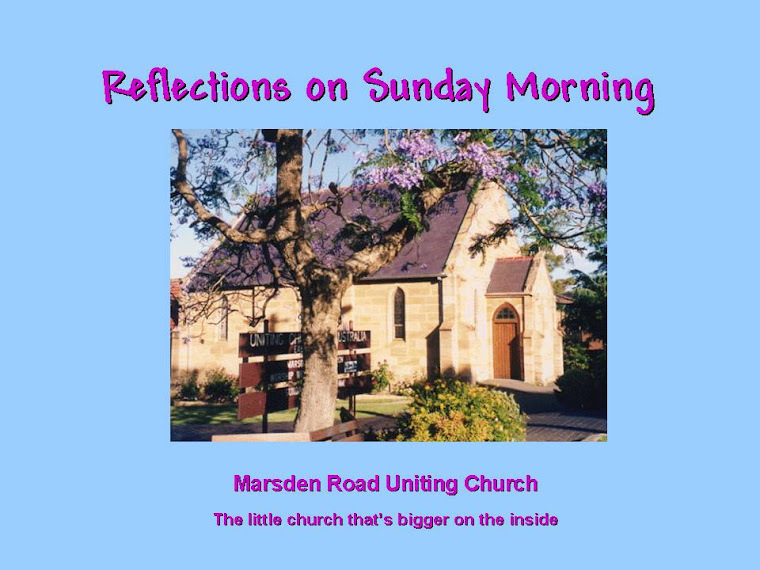 Marsden Road Uniting Church: Sunday February 5. John began with an appeal to our God for us to be enabled to be his hands and voice in this world, providing for and comforting those who hunger and thirst, both physically and spiritually. He acknowledged our call to shine God's light and grace out to others, spreading joy and asked that we be freed from our fears so as to include everyone, even those who may not be easily accepted by everyone. He prayed that the joy of God's friendship, will be visible to others. He then confessed, on our behalf, that we don't always live up to our mission and asked for forgiveness, so we will take His message at face value and do exactly what we have been told to do without any diluting to make things more comfortable for us. He asked that our eyes be opened wide. That way we won't be able to avoid the seriousness of our commission. By this time in the service I was feeling most disturbed. We promise so much and deliver so little by comparison with the expectations of our commission. Sometimes I think it would be better if Christians weren't such nice people. We become so comfortable in our own congregation, we forget our real mission is to build the Kingdom. Then the declaration of forgiveness. God's hand of reconciliation is always extended. We can start again. With thanks. Having been reconciled we extended that peace to those near us. Will we be able to remember to continue to spread that peace after we leave each other today and go into the week? Our first act to do so was to gather the offering and pray: "Generous God, you shower us with blessings and call us to share. Thank you for this opportunity to shine your light into the world through our work of justice and compassion. We pray and live in the name of your true light, Jesus Christ. Amen". Hymn 474: “Here in this place new light is streaming”​​​ Continued our focus in this theme. The service of Holy Communion which followed, reminded us of why we meet each week and of the basis for our ability to act in God's name. It highlighted the love of Jesus and his resolute mission to turn the world upside down, that humankind would, at last, focus on what is the authentic message of God. That service also opened our hearts and minds to the need to maintain our relationship with God and each other, all evoking great thankfulness within us. The First Reading: ​​​Isaiah 58: 1-12. Gospel Reading: ​​​​Matthew 5:13-20. John spoke very clearly to us about the fact that we know quite well the message of God but that we don't really want to hear it. I have heard Christian leaders speak of the need to be "sensible" when sharing generously in God's name. We wouldn't want to "go without" ourselves would we? That's exactly what we are called upon to do. 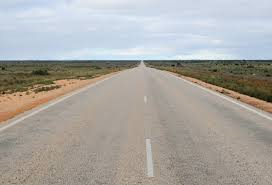 Jesus said that he is The Way. He has shown us how to live but do we do it? None of our time, energy or possessions belongs to us. It all belongs to God. And so do we. "You shall be Holy, for I the Lord your God am Holy." is in the Lectionary readings for February 19. That asks us to be remade in the image of God. Wholly. So, the next question is easy to ask and hard to answer. What are we going to do about it? Hymn 655: “Jesus Christ is waiting” The message continues. We have to respond. John introduced the service: ​God invites us to choose life this day. Could it really be that simple? Could the vast majority of our uncertainties, our insecurities, our gut-wrenching angst fade away if we simply decided to choose life today? The hardest things in life are the least complicated. Choose life. He then spoke of the joy of walking daily with God. He spoke of the value of God's teaching as our shelter from the uncertainties of life: as our guide to authentic life. ​Blessed are those who choose life. John then prayed that we be guided into that authentic life, that we will be able to walk straight without too many of our usual mistakes and stumbles. He asked that we be spiritually fed, so that our faith will grow as our foundation for spreading the joy of believing to others. We were then constrained by our conscience as much as the Order of Service, to confess that we haven't been true to our mission and John, on our behalf, prayed for forgiveness. He pleaded that we be given Grace to make wise decisions and through God's Spirit to follow tight paths. John then made the Declaration of Forgiveness​ and urged that we: "Choose life this day and live." Then all that was left was to give "Thanks to God!" The Peace: It followed that we act: Choose life, and you will find peace. Choose unity, and you will discover that our differences make us stronger, not weaker. In unity and holy love, choose life this day, as you share the peace of Christ with one another. Peace be with you! And also with you! Jesus commands us to love one another as he loves us – and he communicates that love to our hearts through the gift of the Holy Spirit and he wants us to communicate that love to other people. So – a way of describing that is saying that his love is written on our hearts – to stay there forever. ‘You have heard that it was said to those of ancient times, “You shall not murder”; and “whoever murders shall be liable to judgement. But I say to you that if you are angry with a brother or sister, you will be liable to judgement; and if you insult a brother or sister, you will be liable to the council; and if you say, “You fool”, you will be liable to the hell of fire. John focused on anger: "At the heart of our Lord’s teaching today is a clear concern for the damage we can cause through our anger, our tendency to abuse and defile precious relationships and the harm we cause when we compromise precious trusts and commitments..relationships … I am convinced that this is what our Gospel lesson is really addressing. We create a precious trust when we enter a meaningful relationship with another … within our family and circle of friends, at our workplace, and certainly within our congregation." Then the prayer after the Offering said it all: May the gifts we bring before you this day be signs of our commitment to choose life, as we walk in your ways and grow united in your Son, Jesus. May the offering we share with a hurting world bring the blessings of life and the happiness of friendship. Amen. ​​Who is able to stand in the face of the storm and not be moved? Who is able to kneel before the Lord and not be put to shame? Those who walk blamelessly and speak truthfully with gentleness from their whole heart. Those who are not afraid to appear foolish in the pursuit of peace. ​What does the Lord require of you? ​To do justice, love kindness, and walk humbly with our God. ​With what shall we come before the Lord? ​With speech that is gentle, and words that build up. ​With actions that bring peace, and works that lift up the lowly. ​Come, let us worship the Lord our God in spirit and in truth. Hymn TIS 454: "Worship the Lord in the beauty of holiness"
​​Let the hills hear your voice, O Lord, let the mountains quake before you. Let all who call on your name walk in the ways of righteousness and peace. Let all who look to you for help be blameless and do what is right. May our words be gentle and may our hearts be free from guile and deceit. May our actions be rooted in justice and mercy, and may we be known as peace makers, the blessed children of God. Amen. John prayed on our behalf, admitting that when life gets too big for us, we seek blessings for ourselves rather than looking after the needs of others. He confessed, for us, how we react to what others do rather than act in God's name. When wounded by the actions and words of others we seek approval rather than being a blessing for others. "Fill us with a hunger and a thirst for righteousness, that we may be pure in heart, merciful and kind, and walk humbly in your ways. Amen." The God who blessed us to be a blessing is stronger than our weaknesses, and greater than our failings. Even when we fall short, God’s love embraces us and sets us on our feet again. Blessed are the peacemakers, for they shall be called children of God. As God’s beloved children, let us share the peace of Christ with those around us. Micah 6: 1-8 Hear what the Lord has to say. He has taken you out of the land of slavery and been with you all through your history. Remember. What will I do? Will I bring burnt offerings? Will I make sacrifices? Matthew 5: 1- 12. 1 When Jesus saw the crowds, he went up the mountain; and after he sat down; 3 ‘Blessed are the poor in spirit, for theirs is the kingdom of heaven. 4 ‘Blessed are those who mourn, for they will be comforted. 5 ‘Blessed are the meek, for they will inherit the earth. 6 ‘Blessed are those who hunger and thirst for righteousness, for they will be filled. 7 ‘Blessed are the merciful, for they will receive mercy. ​​​In the book of Micah, the Lord is structured and methodical. The Lord tells Israel everything that is on God’s mind. The Lord gives exact, historical details of what the Lord has done for them. The Lord reminds the people how God has never left them, not one time. The Lord brought them up out of Egypt, redeemed them from a life of slavery, gave them leaders, and protected them! There is no question of the Lord’s presence and action in their lives. ​​​​​​Today, as New Testament people, we may think that these requirements have been replaced by the cross. Yet, if injustice, poverty, and oppression exist in our world, we need to be reminded of the Lord’s words. Do justice. Love kindness. Walk humbly. Three small phrases perhaps, but they carry the weight of the Torah and the New Testament alike. O mortals, human beings, why should we try to offer more than what is asked for when, even now, we cannot give the minimum the Lord has required? These are three paragraphs of John's sermon. They are the ones that came home to me most particularly. We forget what God has done for us. We forget that he is wise and we are not. We forget that it has been his wisdom that has made our lives blessed and we try to go our own way. We need to remember to abide by his teaching. Hymn TIS 618: "What does the Lord require"
​In his prayer John prayed for the needs of all people, particularly those who exist in harsh situations, through no fault of their own but through the fault of people who are seeking their own advancement. He prayed for Godly leadership and then prayed for our congregations and the needs of those known to our congregation who need special support at this time. We then joined in The Lord's Prayer. Hymn TIS 448: "Blest are the pure in heart"
​​​Seek justice and discover God’s blessings. We go forth to walk humbly before our God. ​​​Practise kindness and touch Christ’s presence within. We go forth to follow the way of peace. ​​​Share mercy and abide in the Holy Spirit. We go forth in the footsteps of compassion.